Was $2,299.97 Shop now and save! Product Description Subtle Symmetry. 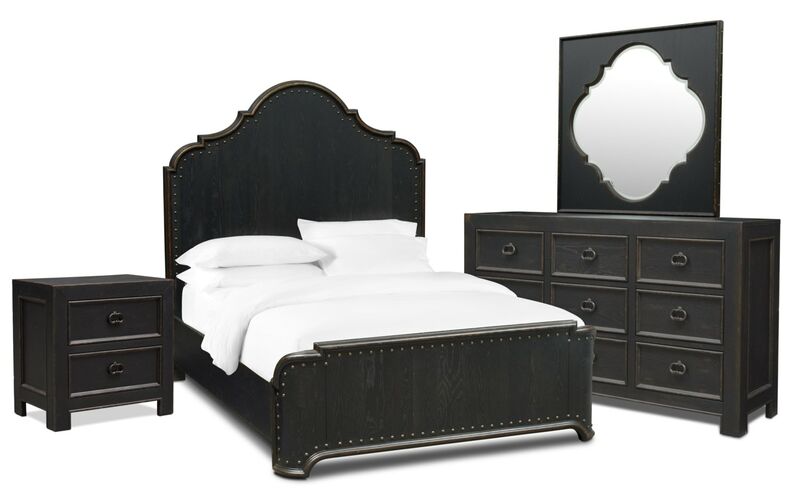 The Lennon 6-piece king bedroom set offers intricate detailing that truly astounds. Featuring carved inset drawer fronts that create depth and bronze nailhead trim and hardware, this set exudes modern farmhouse charm. The distressed kettle black finish and quatrefoil accents create a fluid look throughout the ensemble. Customer assembly required. Unique Features: The carved head- and footboard incorporate a quatrefoil-inspired silhouette, creating fluidity among the storage pieces. Carved inset drawer fronts create depth. A distressed kettle black finish is complemented by bronze nailhead trim and hardware. A quatrefoil-shaped mirror features a 1-inch beveled design.